Carrying something on you on a consistent basis, it's your every day carry! 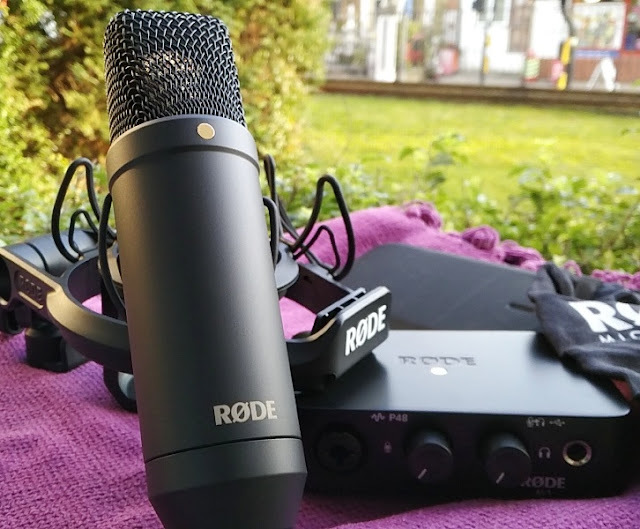 From power banks, thumb drives to smart watches technology has vastly improved the things we carry the most although it's wise sifting through the most important everyday carry that will keep you prepared for whatever life will throw at you. 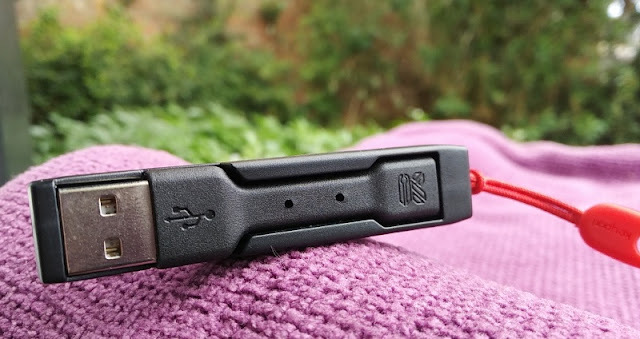 when deployed the NEBA knife is twice the size (5 inches) in length. 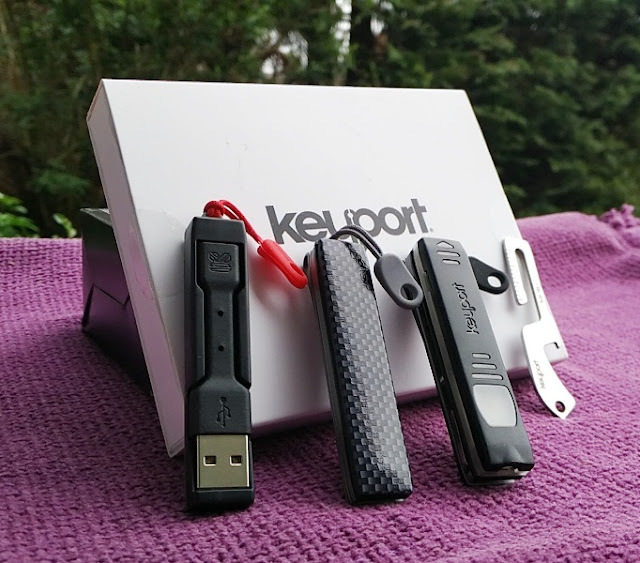 A smart way to expand your every day carry gear without increasing weight is with Anywhere Tools by Keyport, which lets you mix and match different but complementary multi-tools so you can use them interchangeably. 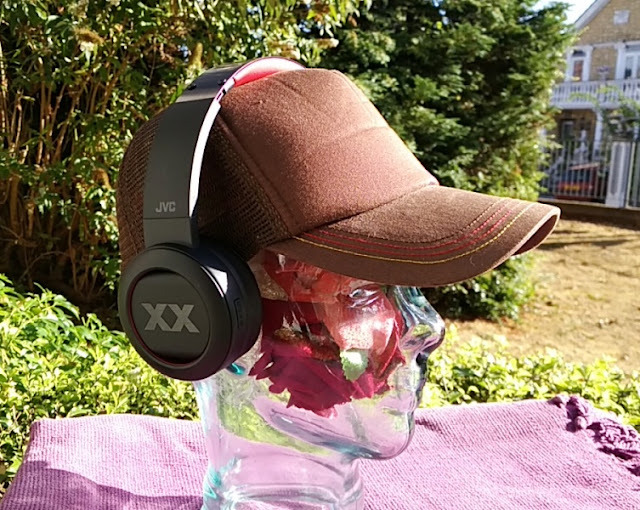 Very useful indeed, especially if you are a survivalist, prepper or commuter who wants lightweight, convenient every day carry. 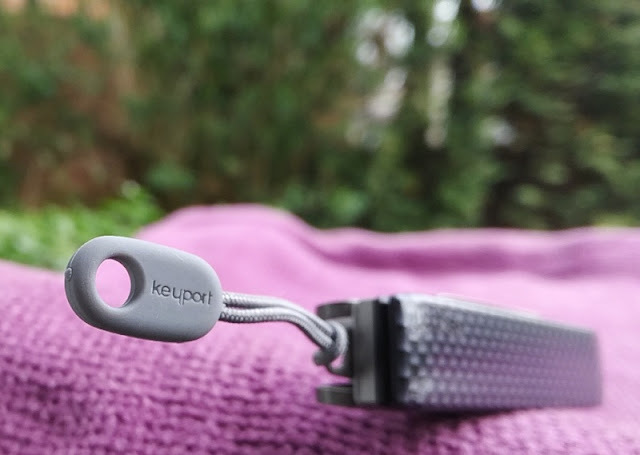 The Keyport Anywhere Tools main modular system - the Anywhere Pocket Clip - forms the foundation for Keyport modules and Keyport accessories to be attached, clipped and stacked to the Anywhere Pocket Clip. 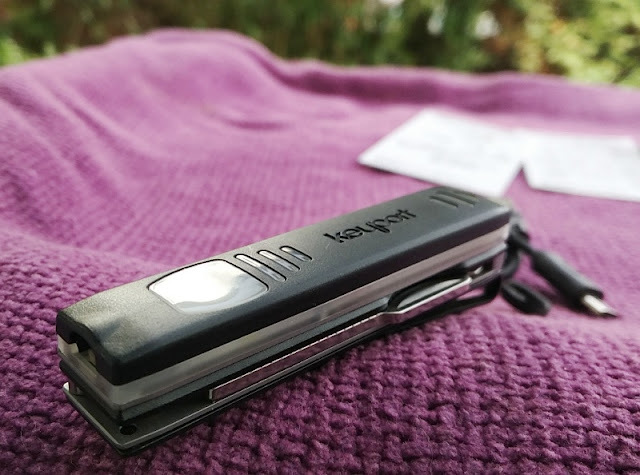 The Keyport Anywhere Tools ecosystem is pretty nifty because you can stack up to 3 modules per Pocket Clip or up to 4 modules when using the Keyport Pivot key organizer. 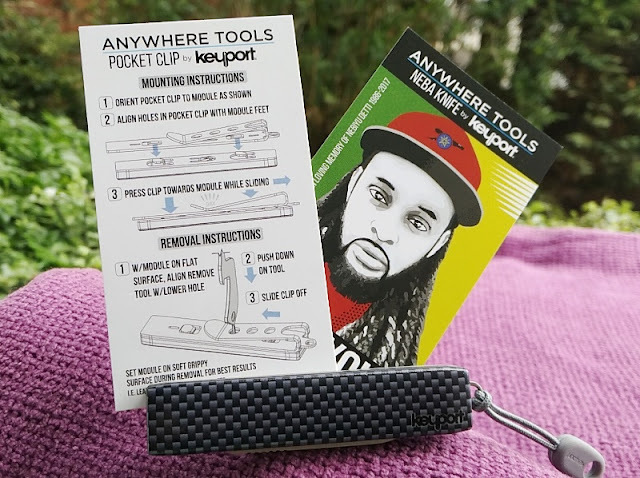 This means with a set of three Pocket Clips and one Pivot key organizer you can potentially carry 20+ handy tools with you taking little to no space. 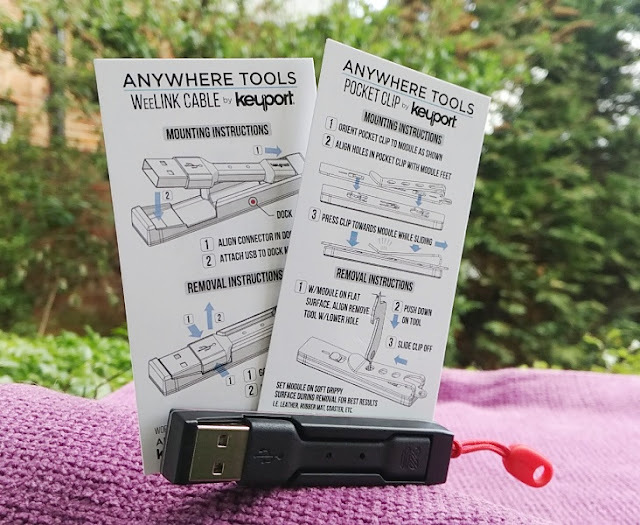 Keyport Anywhere Tools has a very small footprint, measuring just 3 inches long and up to 2 inches thick depending on the number of modules you stack. 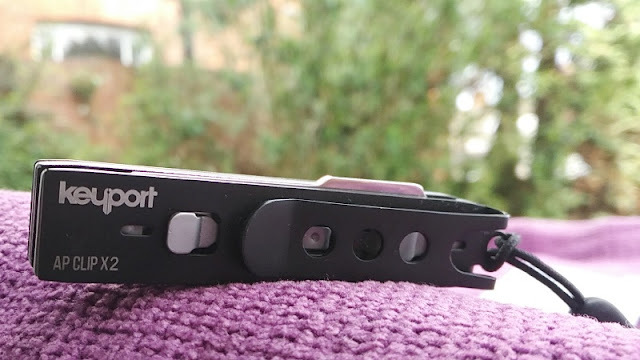 a spring clip, the Anywhere Pocket Clip, which weighs 8.5 grams and comes in black, gun grey, spectrum colors. 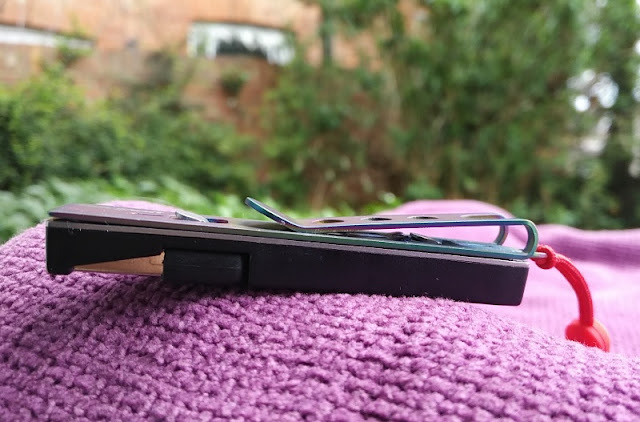 The clip itself measures 4.5 cm long and can double as a nifty money clip. 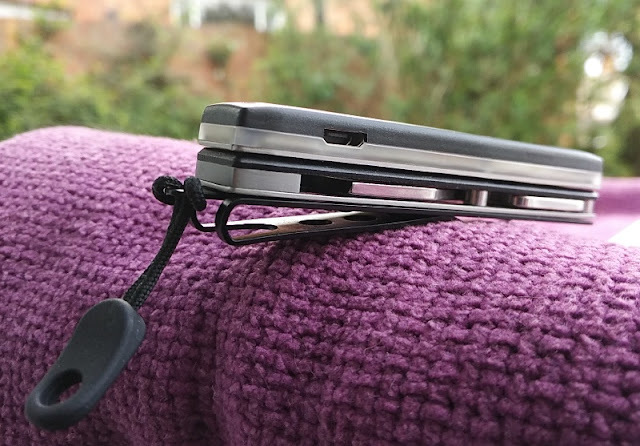 The Anywhere Pocket Clip is constructed of stainless spring steel with PVD (Physical Vapour Deposition) coating finish for increased wear, scratch and corrosion resistance. 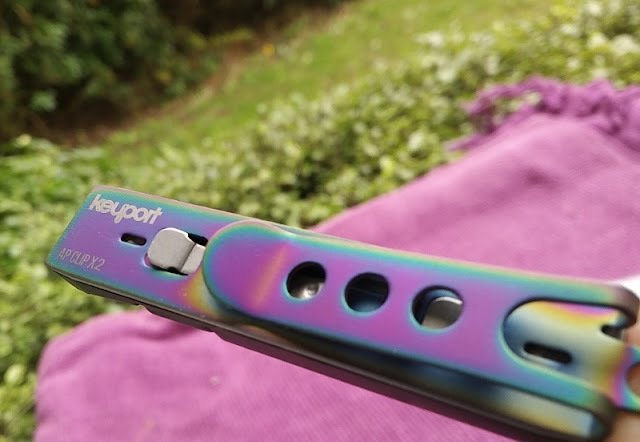 It's nice that Keyport uses PVD finish for the Anywhere Pocket Clip as PVD is an environmentally friendly process kinder to the environment than, say, electroplating. PVD is pretty durable but not as durable as, say, cerakote ceramic coating used on firearms which coating lasts a lifetime. 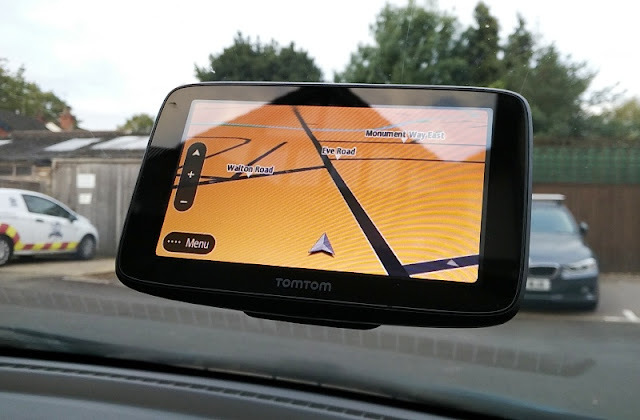 Ordering Anywhere Tools is uncomplicated and easy to do. Once you choose your Pocket Clip color, you pick the Keyport modules which include the NEBA Knife Module, Pocket Flare Module, WeeLINK micro USB Charging Cable Module and MOCA II Module. 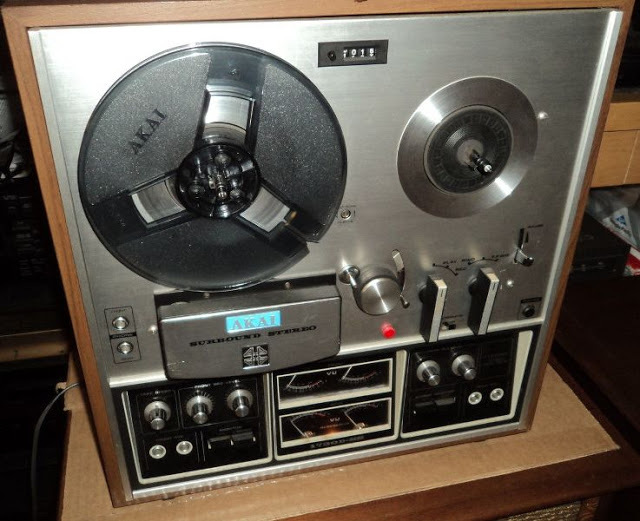 You can use Anywhere Tools as single stacks with single modules or multi-stacks of two or three modules. When stacking three modules, you have to use a NEBA knife or MOCA II modules as these modules provide a mid-foundation for a third module to be stacked on. 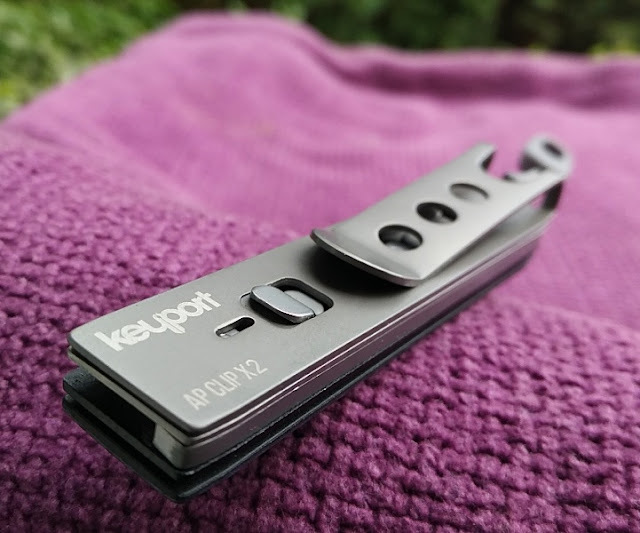 If you already own a Keyport multi-tool, you will find building the Keyport Anywhere Tools straightforward as it works the same way although bear in mind that the Anywhere Pocket Clip is not compatible with Keyport Slide or Pivot. 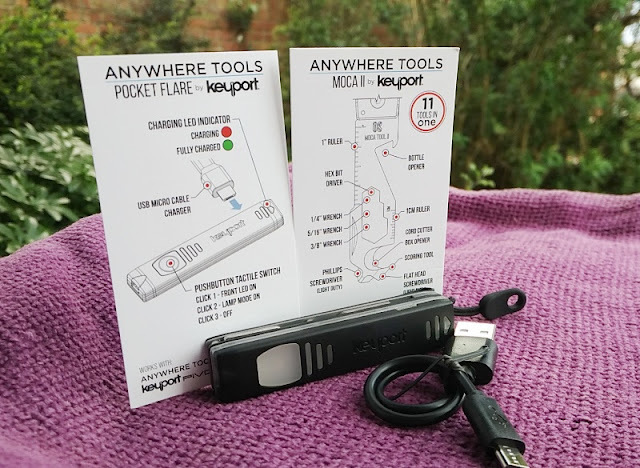 Functionality-wise, the Keyport Anywhere Tools are practical enough to serve their purpose well. 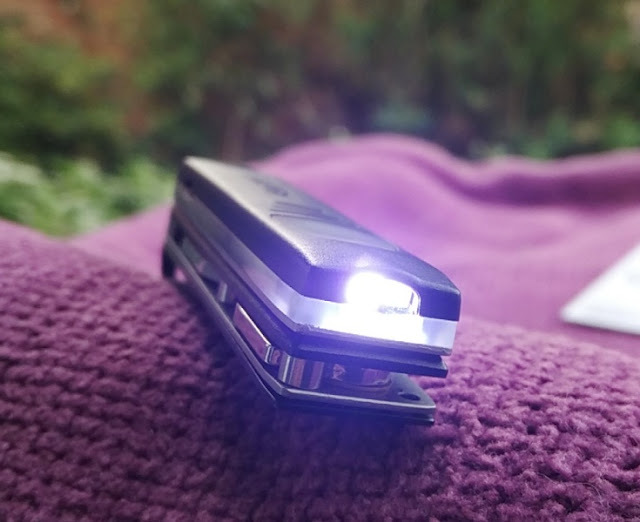 The Pocket Flare Module outputs a decent 27 lumens although the brightness of the flashlight is lower than the torch light of the newest smartphone which is between 40 lumens and 80 lumens. With that said, the Pocket Flare Module has a few advantages going for it that compliments the flashlight of a smartphone. 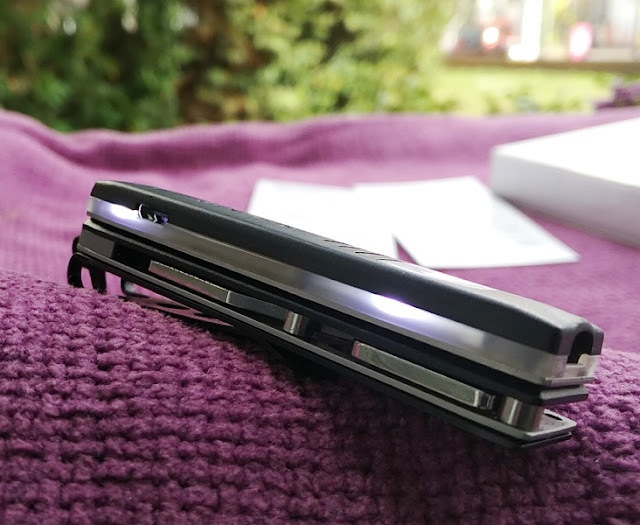 For one, the Pocket Flare outputs a beam light whereas a phone's light is a wide range flood. 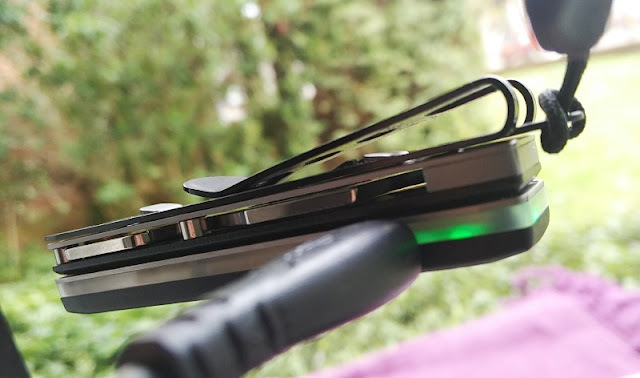 Secondly, sliding the 3-way switch on the Pocket Flare Module is definitely much more convenient than going through your phone to turn on the flashlight, plus it doubles as a good backup when the battery on your phone runs flat. 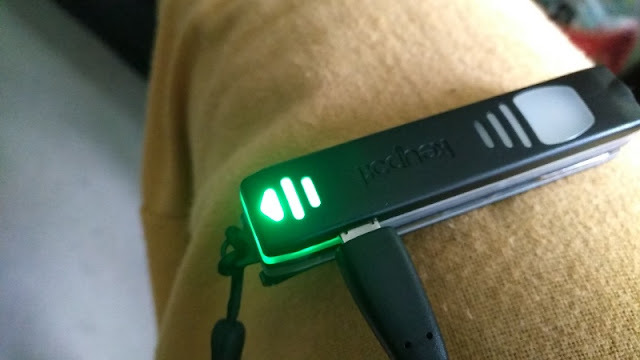 During charging, Pocket Flare lights up red and then turn green when full charge is complete. When close to full charge, the red and green flashes intermittently which is nice. 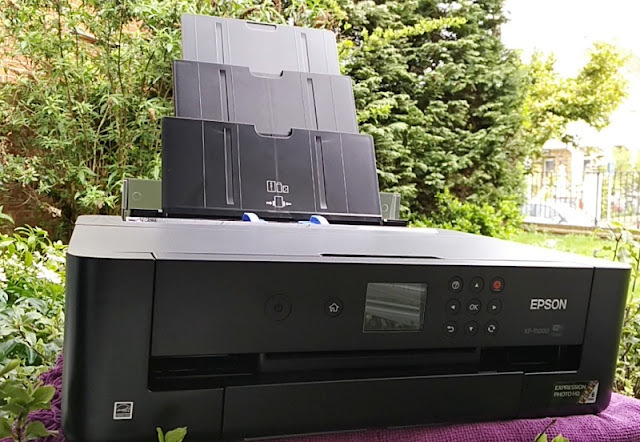 The lithium-ion rechargeable battery has a MTBF (mean time between failures) 400 +/- 100 charge cycles so it's similar to most phone batteries which have about 400 charge cycles before they start to degrade. 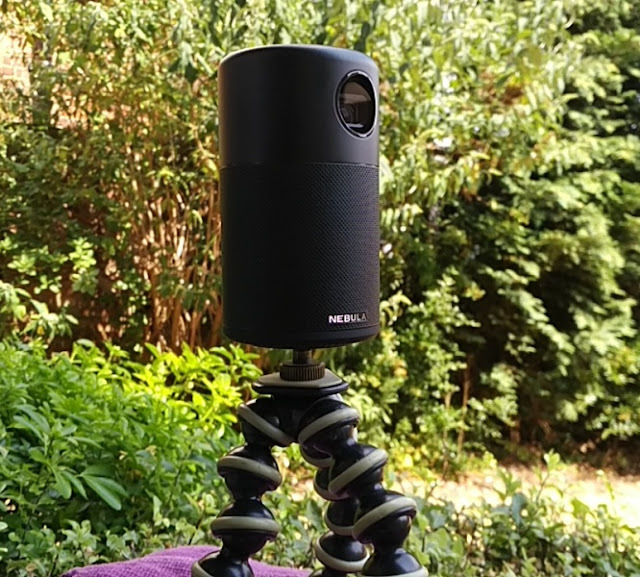 The Pocket Flare also features a lamp mode, which lights up the base of the module via four leds (6 lumens each), turning the Pocket Flare effectively into a 24 lumen lantern light. 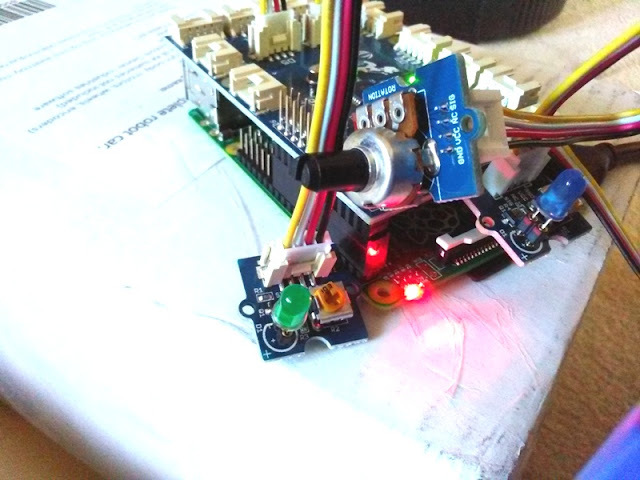 Charging the Pocket Flare module is as straightforward as charging any other USB device. 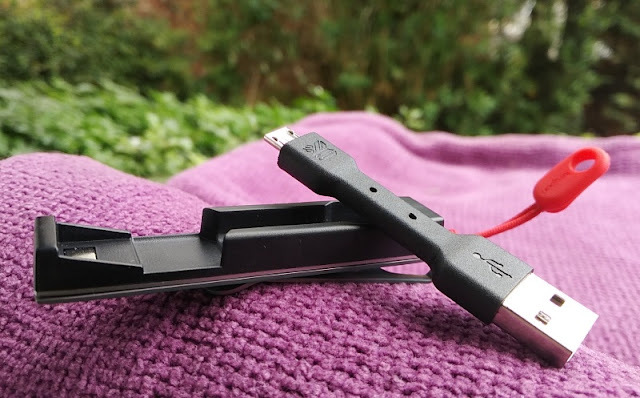 Pocket Flare has a micro USB port on the side where you can insert the WeeLINK or any other micro USB charging cable. Speaking of the WeeLINK module, it is a USB-A to micro USB 7.2cm long charging cable with a rubber sleeve made of TPU and PC material. 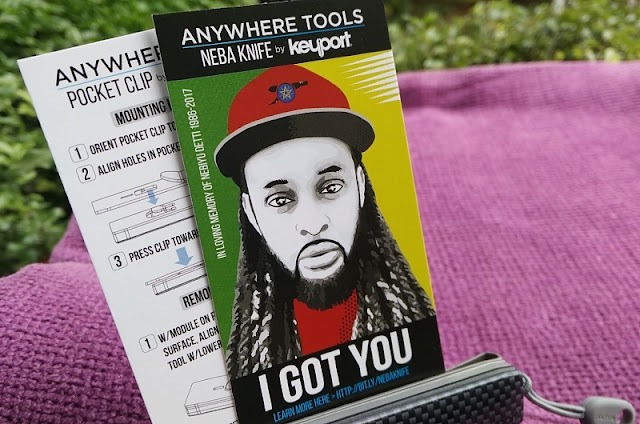 The tactical side of Anywhere Tools comes by way of the NEBA Knife Module which is a very small EDC knife with a 2-inch clip point blade that is perfect for detailed cutting or for cutting something inside a very small crevice. The NEBA Knife slip-joint blade comes with a half stop safety feature to prevent the blade spring closing and cutting your finger. 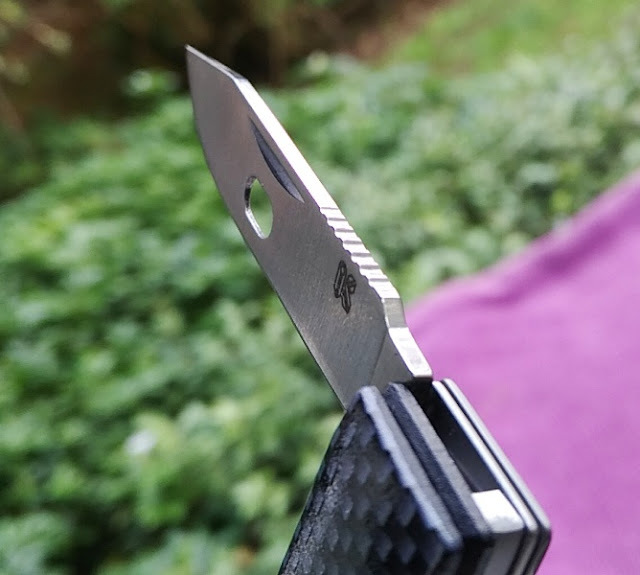 The notches (jimping) you see on the back of the NEBA knife blade are designed so that you can rest your thumb to better control the NEBA knife. 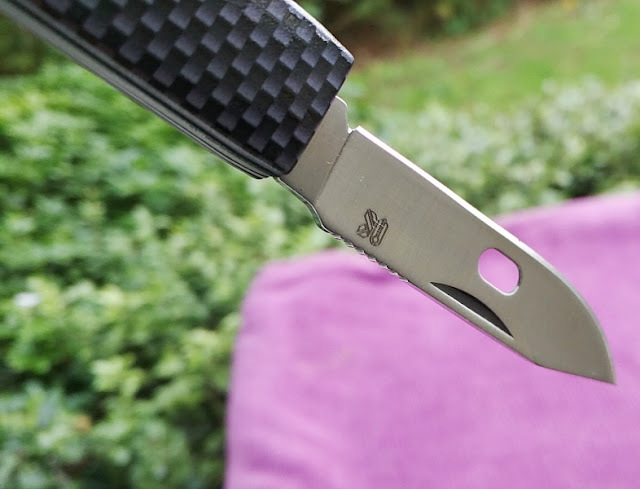 The handle of the NEBA knife is made with 420 stainless steel and 6061 aluminum, while the NEBA blade is made of 8Cr13MoV steel, which is middle-of-the-road between VG-10 cutlery grade stainless steel and 420 series low grade stainless steel. 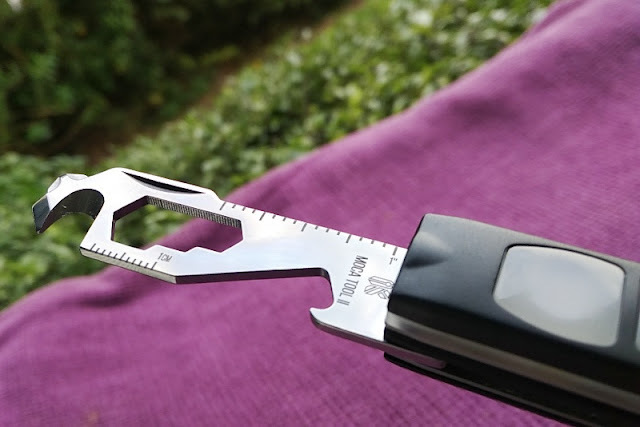 Being a 11-in-1 multi-tool, the MOCA II Module is by far the most useful of all the Keyport Anywhere Tools modules. 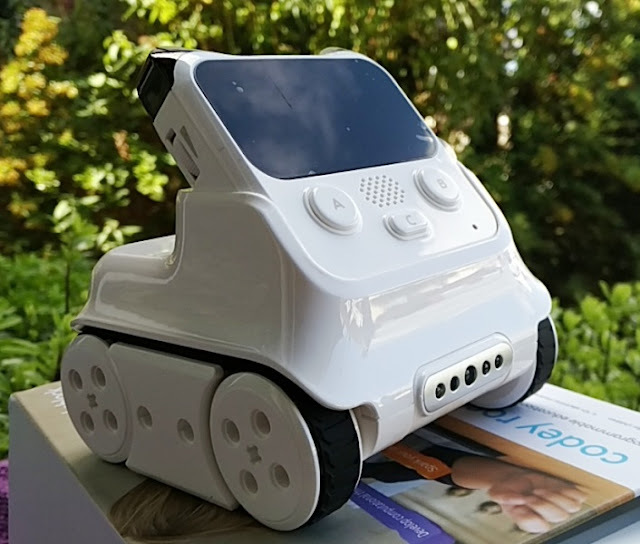 MOCA II is a refined version of the previous MOCA 10-in-1 module that came out in 2014. 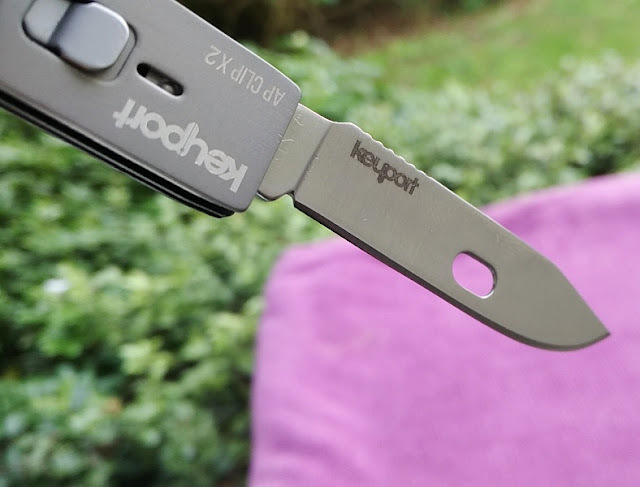 MOCA II features 420 stainless steel and 6061 aluminum construction, a sharper cord cutter, a Phillips and a flathead screwdriver and a nail nick opening system, which is the same type found on the NEBA knife and Swiss Army knife. 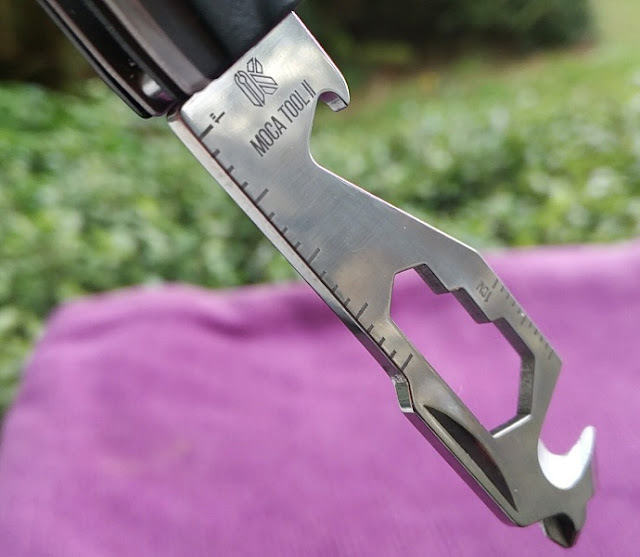 MOCA II eleven tools include a bottle opener, flathead screwdriver, phillips head screwdriver, cord cutter, box opener, scoring tool, hex bit driver, 1/4 inch wrench, 5/16 inch wrench, 3/8 inch wrench, 1 inch ruler + 1 cm ruler. 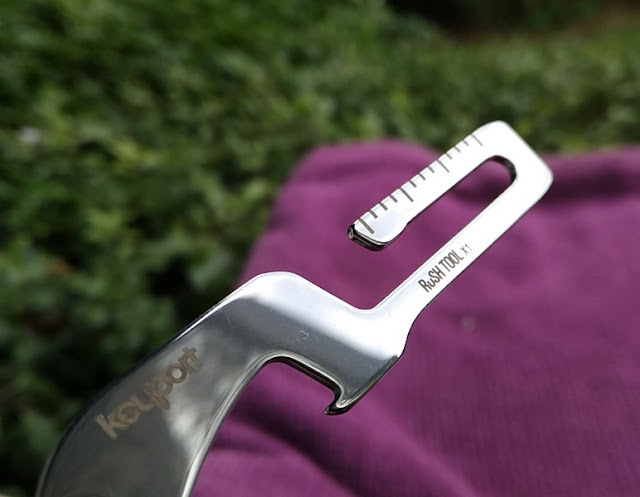 The RuSH Multi-Purpose Tool is another nifty 5-in-1 tool that is a bottle opener, ruler, belt loop hook, keyring and removal tool for unclipping modules. The RuSH tool is just 7cm long and 3mm thick. 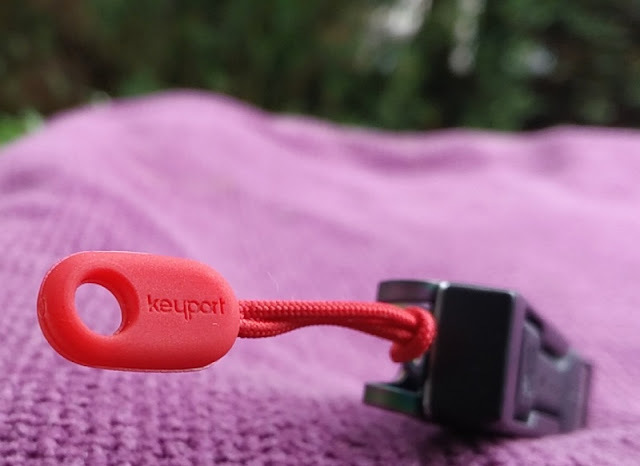 The small circle you see on the far end of the RuSH Multi-Purpose Tool, measures 4mm in diameter so it's large enough for you to thread a keyring or ParaPull lanyard as a keychain. 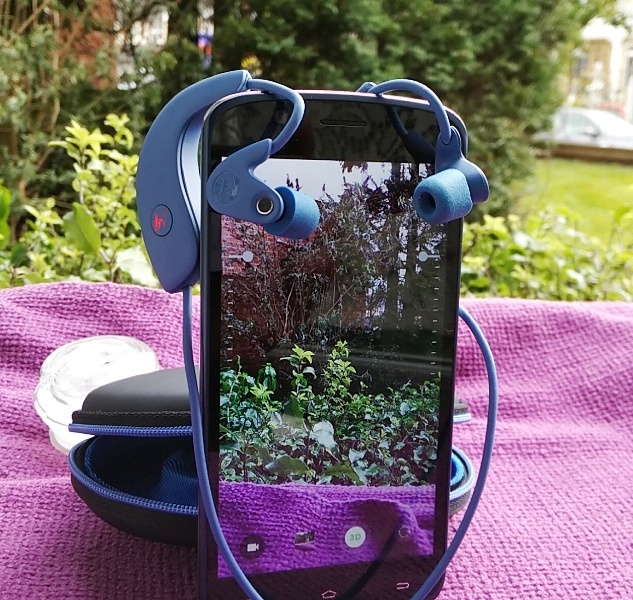 The ParaPull features a soft rubber grip with a 4mm diameter opening. 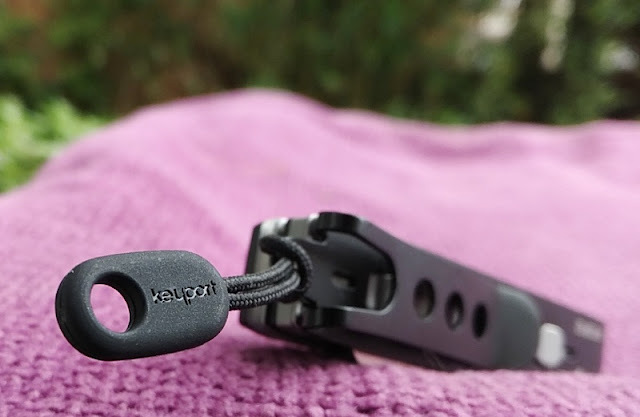 The ParaPull lanyard cord is made of paracord, which is parachute cord made of lightweight nylon kernmantle rope, while the rubber grip is made of TPU material. 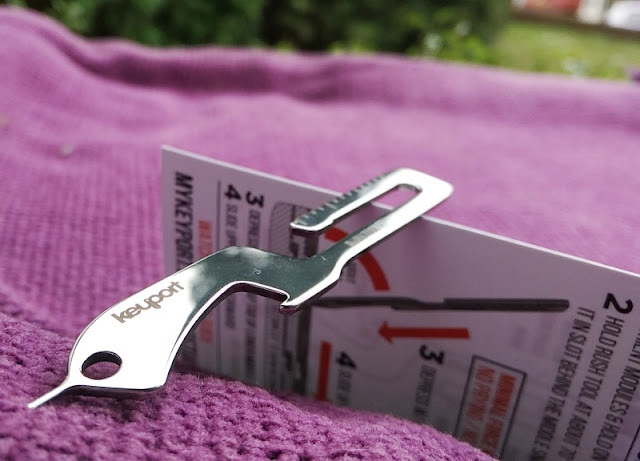 The ParaPull lanyard has a maximum pull rating of 20 pounds before it snaps. 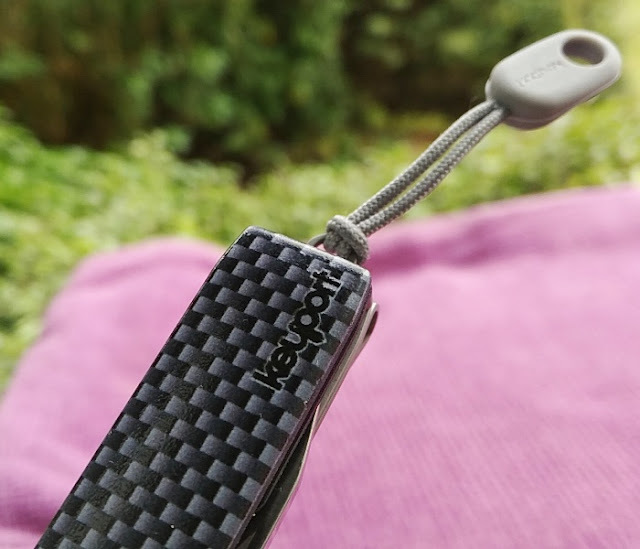 While the ParaPull isn't 550 cord, the ParaPull lanyard can definitely hold its own, namely 18 liters of water which is pretty good considering that the ParaPull lanyard is only 7cm long and weighs just 5.6 grams. 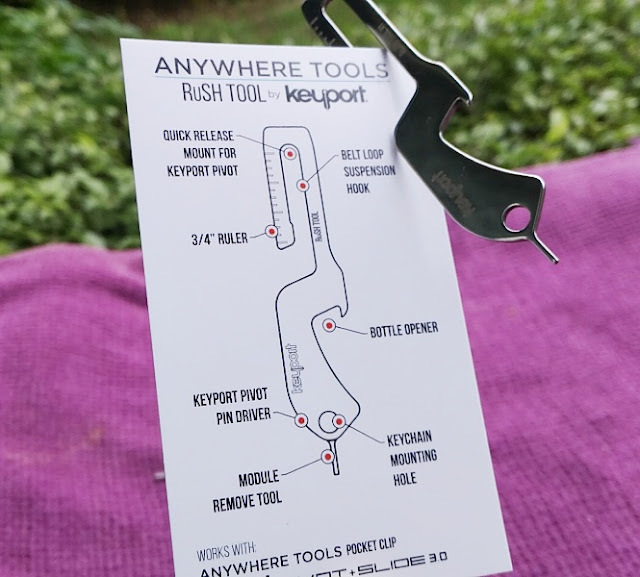 Keyport Anywhere Tools essentially picks up where Keyport Pivot and Keyport Slide 3.0 left off, adding some new Keyport accessories in the process including the ParaPull lanyard and the RuSH Multi-Purpose Tool.